No fewer than 3,000 Ghanaians resident in Enugu on Friday converged at the Nnamdi Azikiwe Stadium, Enugu to watch Ghana's CAF Confederations Cup representative, Kumasi Ashanti Kotoko, held their first training session in preparation for Saturday's cracker against their Nigerian opponents, Enugu Rangers International. www.ghanaweb.com reports that the Ghanaians who flew straight into Enugu yesterday evening trained under the watchful eyes of their German coach, Hans Diefer Schmidt with the Ghanaians looking from close range. Some of them promised to give tips on how to beat Rangers on match day. The Ghanaians hadarrived Akannu Ibiam International Airport Enugu on Thursday evening aboard chartered Ghanaian Airforce jet, G 520. The 37 man contingent is made up of 18 players including a Cameroonian, 9 officials and 10 journalists. Enugu Rangers P.R.O., Mr. Edwin Eze, received the team at the airport on behalf of the Rangers management. Speaking to journalists at the Enugu Airport, the President of Ashanti Kotoko Football Club, Retired Major Lawrence Larson said that they were not in Enugu on picnic but on strict business of winning the match, adding that, though they expect strong opposition from Rangers, they are optimistic of winning the match tomorrow. Kotoko's German coach, Hans Diefer Schmidt said that Rangers are physical, strong and confident team but, that Ashanti Kotoko would out play and out score them tomorrow. The match which comes up tomorrow, Saturday at the Nnamdi Azikiwe Stadium Enugu from 2:30pm is expected to be explosive and thrilling. It has already gathered a lot of attention as both sides are battling for the leadership of the group. 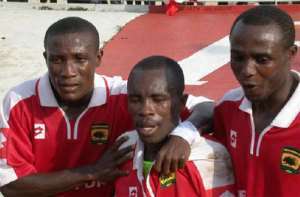 Kotoko beat Rangers 3-1 when both sides met in Kumasi last month.